Last Saturday night, we had a storm go through our area. One bolt of lightning hit very close to our home, and I turned to our media center to see the light our Apple AirPort Extreme router turn yellow, and then fade out. Although nearly all the cables in our neighborhood are underground, there are still various locations where those cables surface, such as the cable company distribution points and of course, where cables go into our house. So although our technology is connected via a surge protector, there is nothing “in-line” to stop an electrical surge through the cable coax. But that is what happened…a surge took out the cable modem, and then continued via the Ethernet cable to our Apple AirPort Express. Our AirPort Express was old…perhaps a 2008 or 2009 model, but it worked well. Even though it was not AC rated (the latest spec for wireless), its N speed was providing 25 Gigabit downloads to our devices. That 's enough for four Netflix streams without any stuttering. My dad loves to come to our house because our Internet is significantly faster than any other place he visits. But alas, the wifi router was dead. I was able to go to Comcast and get a new cable modem; but I had to order an AirPort Extreme router. I could have bought an AirPort Express, but I wanted the additional ports so we can plug in other “Internet of Things” devices to our router. The Express does not offer these additional ports. So I had to buy a new AirPort Extreme, which has changed form factors. 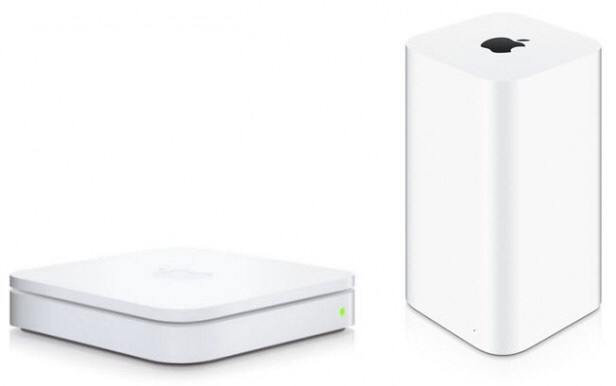 The old one looked like the old white Mac Minis or like the first generation Apple TVs. The new one looks like six new Apple TVs stacked on top of each other (a tall rectangular cube). I didn't want to pay retail ($199) for the router, which is not overpriced (see the cost of other routers with similar capabilities), so I shopped in the Apple Refurbished area, and bought a new router for $125 (plus tax). It was shipped and received two days after my order ( I couldn't order on Sunday anyway). I really like the Apple AirPort options; there is a standalone app that helps you set it up, and there are a ton of choices. You can run two networks (normal and guest), and you can easily control individual users. For example, we turn off my 15 year old stepson's Internet access at 11pm, encouraging him to get some sleep. Yes, other routers offer these features, but they are not as easy to deal with (the app really makes it easy). You can also run things off of the router's USB port, such as a hard drive or a printer. With the new router, it was time to set up OpenDNS again. OpenDNS is a free security service that, in our case, helps filter content in our house. You set up an account with OpenDNS, add the IP address of your router, and then add OpenDNS's filtering DNS address to your router. This sounds complicated but it is rather easy. Then, on OpenDNS, you choose the filtering level desired for your house. We typically choose “moderate” which eliminates most of the major inappropriate things on the Internet. This protects our family from accidentally (or intentionally) accessing sites that they shouldn't be. This is especially true when there is a LAN party of 15 year old boys in our house. While the school's use of iBoss solved about 95% of our inappropriate use of school iPads, if parents had used OpenDNS the previous year, we might not have had to use iBoss this past year (I just saw a tweet that said when we distribute devices, we do so for their families as well. That is also true…we did have situations in. 2013-2014 where parents were using student devices to look at inappropriate things). If you have children in your house, I can't encourage you enough to use OpenDNS and to protect your children! Yes, Comcast offers a cable modem with a router, but we wanted the dual channel router along with the ability to control the router with the Apple app. So…we have a new cable modem and wireless router, and our hope is that we will get at least. 6-7 years out of this device, too. My family hasn't had a very good record as it comes to iOS repair. There was a Minnesota shop that I used successfully until an iPad wasn't repaired for more than two months, and it took a process to get the (poorly) repaired device back (including daily e-mails & calls that were never answered, BBB reports, and eventually calling the police in that community). That business is no longer in business, I am sad to say. My previous iPad (4th Generation) suffered a cracked screen that I took to another local place to repair, and that repair was good. However, my iPhone 5 (previous iPhone) speakerphone stopped working, and the company was unable to do that repair successfully. That iPhone eventually was traded in to T-Mobile for our current iPhones. However, I cannot recommend that repair company because it was unable to follow-through on that repair (and follow-up calls were promised and never followed-up on). We had a faulty iPod Touch, and sent it to a store in Iowa for repair, and that device was damaged by the company and replaced without any request from our part (for the cost of the repair). We felt we were dealt with fairly from that company, but the destruction of the original device makes me hesitant to recommend them for other repairs. Well, my wife's 1st Generation iPad Mini stopped charging. I tried cleaning the charging port with no change–and even took the device to Apple, who verifed my conclusion, but they were unwilling to try to fix the device. As a result, they would sell us a refurbished unit for $199. Keep in mind you could buy a refurbished 2nd Generation (Retina) 64GB device from the Apple Store for $299, so that wasn't a good option, either. Incidentally, Apple's selling price for a normal refurbished 16GB 1st Generation iPad Mini without a trade in? $199. Not much of a deal there. I checked locally, and no one was willing to tackle the charging port, but a company in San Antonio, Dr. Phonez, was. They came up with a Google search for “iPad Mini Charging Port Repair.” I bought the repair online ($89.95), sent in the device ($12 with insurance), and about a week later, it came back to us (their shipping/packaging is included in the price). The iPad Mini works and it charges, with all of its original data, for one-half the cost of an Apple replacement. I have looked the iPad mini over, and I can't see how they repaired it. An iPad screen (any kind) is very difficult to take off, and very difficult to take off without breaking. They did it. And there is no way that they replaced the port AND replaced the screen for $89.95. Again, this was my first repair from them, and we had nothing to lose. If the iPad was unrepairable, it was unusable. So it was an all-or-nothing repair. They did not know that I am a blogger, and I am not receiving any commission for referrals. But as of today, I can recommend Dr. Phonez. You can find them at www.drphonez.com.